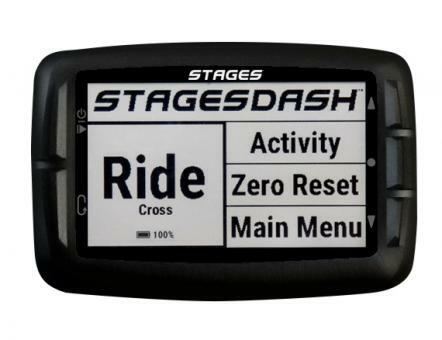 The Stages Dash performance training GPS head unit is specifically designed to coach a rider to his or her best performance. Less than 10 items on stock. Delivery in 1-3 days. The smart head unit designed to enable your best performance. Equipped with on-bike coaching, plus purpose built tactility and mount like no other. One third of the Stages Ecosystem, Stages Dash approaches the concept of cycling data differently by putting a premium on the metrics that help you meet your goals. 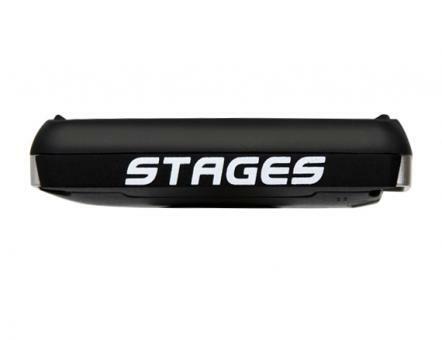 Stages Dash ensures you will improve your performance with power by answering the question: I have a power meter, now what do I do next? Dash is the world’’s most customizable head unit, yet it’’s ready to go out of the box with pre-populated Activity Profiles to help you train with power, heart rate and even RPE. With wirelessly synced workouts, on-screen explanations and automated on-the-bike prompts, riding Dash means you’’ll never have to stick post-it notes to your top tube again. 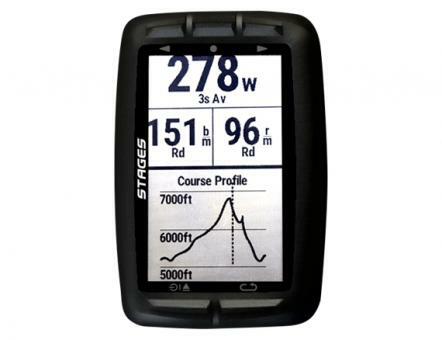 On the road or trail Stages Dash delivers all of your riding data to your fingertips through a high-contrast, high-resolution display. Once a ride is over the unique Stages Ride file allows for quick workout analysis including a visual overlay of the prescribed workout and your actual ride data—Stages Link required. When using Stages Link, the system even adapts through automatic FTP and Training Zone tracking to keep you on top of your performance. Basic Stages Link management and analytic software are included gratis, with the option to upgrade to a powerful full-access version that offers deep yet simple to understand analytics plus access to training plans and the revolutionary Link training plan builder. Stages’’ Over the Stem Mount orients Dash over a rider’’s stem and accommodates the use of 31.8mm and 35mm handlebars. The Stages Aerobar mount is made to mount Stages Dash on the aero extensions of triathlon or time-trial bikes allowing for optimal screen and button placement when in the aerodynamic position.